What could be more terrifying than cruising along a highway and suddenly finding yourself topsy-turvy, spinning, the victim of a rollover crash? Sadly, over 40,000 of these incidents occur every year in this country. And although only one in 100 crashes involves rollovers, this type of crash results in one in three deaths on American roads. What are contributing factors in rollovers? 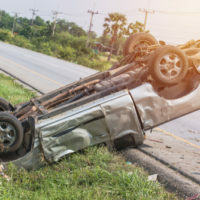 What do we know about rollover accidents? Of all occupants in fatal rollover incidents, roughly 75 percent were not belted in, and over 60 percent were consequently ejected from the vehicle. Crash avoidance maneuvers are not employed in roughly 40 percent of single vehicle rollovers and in nearly 60 percent of multi-vehicle incidents. What are protective factors in vehicle design? Anti Lock Brakes: Wheel sensors assist in safer braking patterns. If you or a loved one experiences a serious accident of any kind, the experienced personal injury legal team at the Law Offices of Robert W. Elton may be able to help. Contact us in Daytona & Ormond Beach for a confidential consultation.